Whoever said “First comes love, then comes marriage” was forgetting a slice of living hell we call dating. To persevere, women must have help — in the form of practical advice, humor, and camaraderie. Come-Ons, Comebacks, and Kiss-Offs provides all three of these. 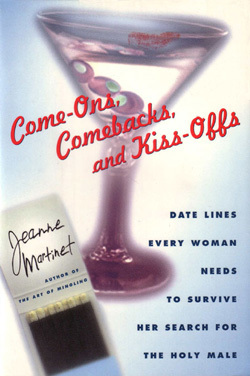 In this uniquely useful and funny book Jeanne Martinet guides the reader through the treacherous and often nerve-wracking dating waters with humor and honesty. Herself a veteran of the dating wars, Martinet offers anecdotes, dead-on insights and men-tested, ready to use lines for every dating situation, no matter how awkward, exciting, unusual or just plain mortifying. A must have book for surviving first phone calls, stiff dinner talk, rejected passes, nervous leave-takings and guys who can’t stop talking about their computers.